Preview:The decision to bat Rahul Tripathi at number five continues to baffle the experts as D’Arcy Short was run out once again for a single digit score. There are no doubts about the big hitting abilities that Short possesses and two run outs have not allowed him to showcase his skills, but what the Royals need to realize is that playing four openers in their top six is affecting their death overs batting as well. Sanju Samson has been the only shining light for the Royals and a full game will test their bowlers as well. The worrying thing for Rajasthanwould be the fact that Quinton de Kock and AB de Villiers found form in their previous game and even more worrying would be the fact that Virat Kohli is yet to fire! McCullum got out for a duck in his last outing and if all four manage to click then it could mean curtains for Rajasthan. From the perspective of finding form, even Stokes is yet to deliver for the Royals and Bangalore will be well aware of his destructive capabilities. Once again, they would be relying on Umesh Yadav who has bowled with hostility and control in the opening two games and has accounted for some big names already. Having fallen down the pecking order of the Indian pace battery, Yadav is sending strong reminders to Kohli about his capabilities. 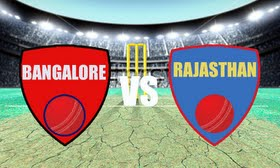 Head to Head: Bangalore lead Rajasthan 8-7 in the 16 match-ups between them, with one ending in no-result. Rajasthan previous fixture against Delhi saw Jaydev Unadkat bowl his 1000th delivery in the IPL without ever overstepping. He is the only fast bowler in the tournament to bowl 1000 plus balls without bowling a single no ball. Bangalore win against Punjab the other night was their first in 12 games with AB de Villiers in the side. Umesh Yadav has now won seven man of the match awards in the IPL – the most by a specialist fast bowler in the tournament. Ashish Nehra comes second with six.